Adding greenery to the side of a building or even to the interior through a cable system comes with several benefits. Beyond the beautification of the facility, the plant life improves the oxygen level in the building, while many plants also act as natural air filters. Realistically, there are very few cons and almost all pros when it comes to adding plants to your building. You just need to know what kinds of plants are suitable for a green facade or cable system. There are dozens of plant variations you can use for a green facade and cable systems. The current climate conditions – sun and wind exposure – special consideration should be given to the location of the facade, i.e. will it be in the top corner, side of the wall with the greatest exposure? Do the plants have shallow and fibrous roots? Will they fit into the system you are planting them into? The watering requirements – does the species you are considering require a low level of water? Shade – are some plants being used to provide shade for other plants or parts of the building? Are those plants hardy enough to sustain harsher climate conditions? Growing Environments – knowing the difference between how plants grow in the ground or on the roof and the impact on plants from the climate in vertical conditions can really impact your choice. Factoring all of these elements and more can lengthen the lifespan of the facade and also significantly reduce the ongoing maintenance and repair costs. Self-Clinging– Self-clinging plants attach directly to your building facade. They create a self-supporting vegetation layer on the surface of the wall. The plants can cling to the wall through suckers, disks or adventitious roots. Some species that work well growing directly onto a wall or building surface are Ficus Pumila, Parthenocissus quinquefolia and Parthenocissus tricuspidata. Twining & Tendrils – Plants with twining stems or hooking and clasping tendrils require a support system that can support the plant to grow upward and across the structure. Some specie examples for plants that need support systems in place are Clematis aristata, Pandorea pandorana or Wisteria sinensis. Understanding how plants attach to your building is vital in proper selection. Remembering also these species depend on the initial consideration outlined above when choosing particular plants. And a lot is determined from the location of the building and area where it stands. When the design team are working out which plants to select they also pay close attention to the screening, growth rate and the light tolerance of the plant. These vary significantly between the different species. 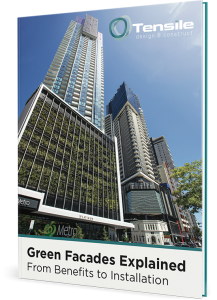 No matter the height of your building, the amount of vegetation you’re looking for or the purpose of the greenery, there are plenty of plant options that can be used on green facades and cable systems. Tensile can assist in not only selecting the right plants for your facility (which is often based on size and light exposure for the plants) but with the installation of cable systems or trellis support systems for the facade of your building. Speak with our Design Team here for more information.